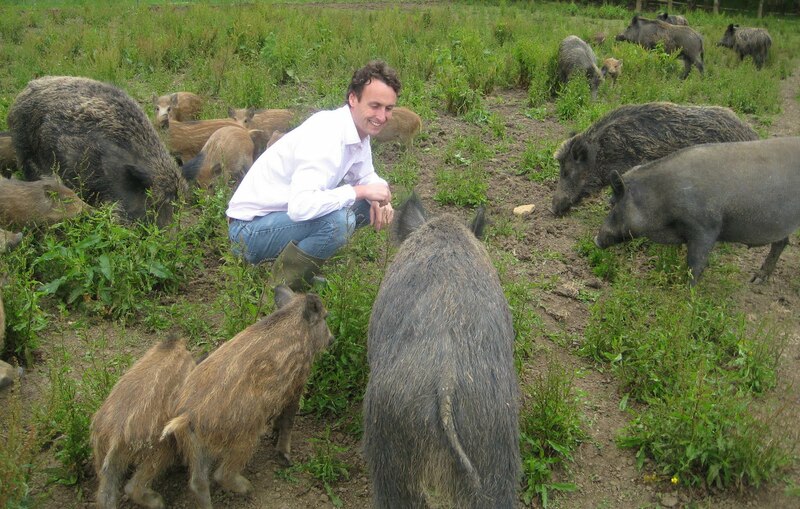 The Real Boar Company's award-winning Salami comes from Farmer Simon Gaskell's own herd of wild boar farmed in the Cotswolds. Produce is supplied to Restaurants such as The Fat Duck, The Waterside Inn, Jamie’s Italians and internationally to The Cinq Restaurant in Paris. What attracted you to farming initially? I used to have guinea pigs, then had some Gloucester Old Spots and couldn’t get mammoths so went for middle ground. How did The Real Boar Company start? Slowly, we had to fence in 20 acres of woodland with a 6 foot high fence, put up a barn and then get a dangerous wild animal license. What have been the main challenges setting up your business? Coping with the naturally wild nature of these creatures, they are not really keen on human contact and do what they want when they want, doing anything with them takes time. Loading them into the livestock box is a particularly perilous job, today four jumped out having had a go at me first! Why did you decide to rear wild boar in particular? With a limited area available to utilise, it was a question of what niche market could work and compliment the woodland. So what makes your Boar so delicious? What's your secret? They live a very natural life in the woods, foraging for all sorts of delicious bits, cherries, nuts, funghi, worms and beetles. With no predators they put on a little fat which helps makes all the difference. Is Boar a healthy meat? It's very low in saturated fat and cholesterol. The boar take 18 months to grow, more than 3- 4 times as long as commercial pigs. I love all our salamis, they are so moorish – we have a slight twist on the continental versions and ours are moister which we suggest sliced thinly like a ham. They melt in your mouth with an explosion of flavour. It is so versatile and can be used in cooking, great in pasta, risotto, wrapped around chicken or served with fish or just to pig out on on its own. Tell us how you make your award winning salami, what's the process? Do you think I would give away trade secrets? Not a chance, they take 3- 5 weeks depending on the weather as they dry naturally in the Wiltshire air. Do you have favourite recipe/s made with your produce you would like to share? I list a couple on our website. A Jamie Oliver which even I can do (I am not a good cook!) and a great salad put together by Richard Bertinet. I tend to put it in a fresh baguette with some cheese and lettuce or just sit down with a drink and have it in the evening. Where do you shop, supermarket or farmers market? All of the above. I do a fair few fairs and always come back armed with goodies. We have a fair bit growing on the farm, my wife has a wonderful kitchen garden. What with that and salami do you need anything else? Thankfully Sainsbury’s do brave the boar and deliver occasionally! Do you buy British produce? Always when possible, we are big into local if the quality is good, local can still be country wide as it beats importing. What does Best of British mean for you? Who do you sell your produce to? We sell direct from our website and to a number of delis, farmshops and larger shops such as Harvey Nichols, Daylesford, House of Bruar. We also sell into trade restaurants such as Jamie’s Italian. You have won numerous awards for your produce, what do you hope to achieve next? It is very rewarding and exciting getting recognition for our products, we are always trailing new varieties. Our last one, Cotswold Game, with boar, venison, pheasant and port has proved very popular. Let’s hope it wins an award as well. We won’t run more boar on our property but I do buy in from other similar minded boar farmers. We run some Oxford Sandy & black pigs who are charming, quite different from their wild brethren, they too make a delicious salami. We will continue adding different lines to the business under the same recognisable quality brand.